Apart from calling up volunteers for beach clean-ups, Rendu has joined with local NGOs and marine nature reserves from different provinces to set up 17 posts by 2017 along the coastline to conduct garbage collection, monitoring and quantification analysis. Rendu’s “Coastal Cleanup and Monitoring Project” was launched in November 2014, and the organization says it is dedicated to uniting social forces, involving the public and coordinating academic institutions and social groups to do clean-ups, conduct monitoring and research the distribution and classification of garbage. The aim is to provide support for government ocean pollution management policies. Boasting a coastline of over 14,500 kilometers and with more than 40 percent of the total population of China concentrated in coastal regions, ecological degradation due to marine plastic pollution is a serious problem. Plastic pollution is reported to affect more than 700 marine species, with 17 percent of these species identified as near threatened, vulnerable, endangered or critically endangered on the International Union for Conservation of Nature (IUCN) Red List. An analysis of 21 Asia-Pacific Economic Cooperation economies in 2011 by the University of Wollongong in Australia estimated economic losses associated with marine debris at US$1.265 billion using 2008 prices, with losses estimated at US$279 million, US$364 million and US$622 million from the shipping, fishing and marine tourism sectors respectively. Although the scourge of plastic pollution isn’t new, it has only come under intense scrutiny in recent years. At the inaugural meeting of the United Nations Environment Assembly (UNEA) in June 2014, delegates from 160 countries adopted a resolution on marine plastic debris and microplastics. The resolution stated that the UNEA would start a study on marine plastics and microplastics assisted by the Joint Group of Experts on the Scientific Aspects of Marine Environmental Protection. The UNEA told the reporter in October 2017 that the organization administers two regional ocean programs in the Asia-Pacific: the Northwest Pacific Action Plan (NOWPAP) and the Coordinating Body on the Seas of East Asia (COBSEA). A NOWPAP Regional Action Plan on Marine Litter was adopted in 2008 among member countries, including China, Japan, South Korea and Russia. Member countries of COBSEA include Cambodia, China, Indonesia, South Korea, Malaysia, Singapore, the Philippines, Thailand and Vietnam. As there is no international convention to regulate the production of plastics, the UNEA submitted a report on effectiveness and gaps on this issue within International and Regional Policy Frameworks during the UNEA Assembly that took place in early December 2017 in Nairobi, Kenya. Research indicates that all coastal nations contribute to marine pollution, but some countries are responsible for the majority of the waste. The most-cited paper on the topic, by Dr Jenna Jambeck and her team from the University of Georgia, titled “Plastic waste inputs from land into the ocean” and published in Science magazine in 2015, estimated that “275 million metric tons (MT) of plastic waste was generated in 192 coastal countries in 2010, with 4.8 to 12.7 million MT entering the ocean.” The study listed five countries topped by China as the major source of the mismanaged waste that contribute to marine plastic pollution. Professor Li Daoji of the State Key Laboratory of Estuarine and Coastal Research (SKLECR) under East China Normal University commented that the research methodologies adopted by Jambeck and her team were too simple to make judgments about who contributed what percentage of marine plastic pollution purely based on national populations. Indeed, more long-term studies need to be conducted before making any judgments. It is true that Asia has driven growth in plastic production over recent decades, and it is the leading plastic consumer, but the source of marine plastic pollution globally remains hard to define, the UNEA told NewsChina. Yet German researchers from the Helmholtz Center for Environmental Research released a report in October 2017 that said the pathway for at least 90 percent of plastic in the sea was river systems, in particular 10 of the world’s biggest river systems. Eight are in Asia – the Ganges, Indus, Yellow, Mekong, Pearl, Yangtze, Hai He and Amur – and the final two, the Nile and the Niger, are in Africa. In China, there has been a surge in legislative, regulatory and implementation actions to address the issue of marine litter – in particular plastic pollution – over the last few years at various levels, after the country started to prioritize environmental protection and restoration. According to the new guideline for environmental protection during the 13th Five-Year Plan period (2016-2020), China will improve environmental protection and restoration to ensure a greener, more sustainable development. In June 2008, a nationwide law banned stores from giving out free plastic bags. Since 2016, China implemented a number of national-level action plans on the prevention and control of solid waste. These include the Action Plan for Prevention and Treatment of Water Pollution, the Action Plan for Prevention and Treatment of Offshore Pollution, as well as the Draft Regulation on Mandatory Garbage Classification. The last regulation was enacted in March 2017 in almost all major cities, aiming to bring the household waste sorting collection rate up to 90 percent and recycling of household waste to up to 35 percent by 2020. While some groups are attempting garbage classification now, there are no accurate figures for recycling at present. During a recent interview with NewsChina, an official from the Environment and Ecological Protection Department under China’s State Oceanic Administration (SOA) stated that continued and enhanced efforts have been made in ocean plastic pollution monitoring and evaluation. Since 2016, there has been intensive research on microplastic monitoring, and some initial pollution analysis has been gained through studies on key ocean areas, beaches and marine wildlife. In order to effectively tackle the pervasive issue of river pollution, the central government promoted a new measure named the “river chief” system and listed river garbage management as a major duty for the new system. The river chief system designates a local high-level party official to be responsible for containing water pollution on a single river within the official’s domain. Apart from controlling garbage input into bodies of water, regular garbage clean-ups have been conducted by local governments in coastal areas. On July 18 2017, the State Council, China’s top decision-making body, released a national import ban on accepting shipments of garbage from overseas, which came into force on January 1, 2018. The banned waste includes waste plastic, paper, slag from steelmaking, waste wool, ash, cotton, and yarn. China, as a major importer of waste, in 2016 alone imported 7.3 million tons of waste plastics, valued at US$3.7 billion, accounting for 56 percent of world imports, Reuters reported. The US and Japan are the two biggest exporters of plastic waste to China. In addition, driven by a push from the center to replace traditional plastic bags with biodegradable ones, China’s market for biodegradable plastics has been growing quickly, and is projected to expand even further. A recent report from Research and Markets titled an “Assessment of China’s Market for Biodegradable Plastics” estimated that in 2016, the domestic market for bioplastics in China had sales of over 130,000 tons, with an additional 160,000 tons exported. The study finds that the growth rate for domestic sales in 2016 was over 13 percent. Lev Neretin, Senior Coordinator from NOWPAP, acknowledged in a recent email to NewsChina the positive side of the actions taken by the Chinese government. He expressed his expectations that China could make continued efforts to improve the design of plastic products, considering life-span and recyclability in order to increase recycling efficiency and reduce the production of single-use plastics. The plastics industry boomed worldwide from the mid-1950s to the 1960s. In China, plastic production only developed in the 1980s, and gradually the country started to face issues of waste and recycling which threatened both land and marine environments. 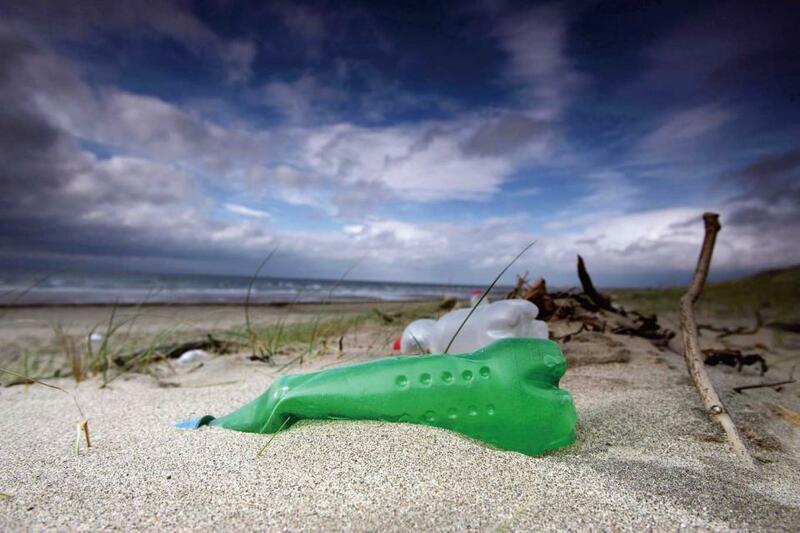 The SOA started annual monitoring of marine litter in 2007 at 50 sites along the coastline. The data and results were compiled and publicized through the annual China Ocean Environment Bulletin. Studies and monitoring raised concerns about the variety, quantity and sources of floating litter, beach litter and seafloor litter. Statistics indicate that locations with high densities of beach garbage include tourism sites, fish farms, harbours and adjacent areas. In answer to questions from NewsChina, the SOA said that although more than 80 percent of floating marine garbage is plastic, compared to other regions globally, the density of floating garbage in the seas around China is relatively low. Internationally, an emerging area of research concerns the distribution and impacts of microplastics (particles below 5 millimeters in diameter). Professor Li Daoji of SKLECR is currently leading the largest national research project on the study of ocean microplastics with grants from the Ministry of Science and Technology. The project, which draws a total of over 30 million yuan (US$4.6m) and includes 16 million (US$2.6m) from the central government, is so far the largest in terms of financial investment in the world. With a team of more than 40 researchers from four organizations, the project has set up over 60 monitoring posts along the coast from the northeast to the southernmost part of China. In addition, at the Yangtze and Pearl River deltas, pollution outputs are closely monitored. After the first year’s monitoring, the project already produced a number of articles published in international journals. The project, Li said, is expected to wrap up by 2020 at the latest. Some preliminary understanding of the variety and quantity of microplastics distribution in coastal regions has been achieved so far. However, Li acknowledged to NewsChina in October that due to the lack of a common methodology in calculating and monitoring, the impact caused by microplastics to marine ecology and the environment remains very limited and vague. “Scientists do have different perspectives on this issue, and this means completely different research results,” Li said. Apart from continuing the substantive research and monitoring, Li said that he had presented policy suggestions to the government and aimed to support the central government in pushing forward legislation in this regard. “Involving society is a crucial factor,” Lev Neretin told NewsChina. He recommended that China could consider implementing a national campaign to reduce and prevent marine litter involving social forces to do beach and river clean-ups, and to incentivize recycling. 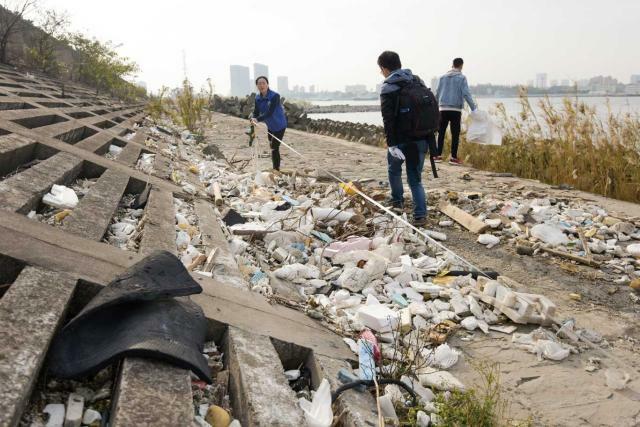 Supported by NOWPAP, the Chinese Research Academy of Environmental Sciences issued a report in late 2013 on “The Role of China’s Environmental Non-Governmental Organizations in Marine Litter Control.” According to the report, a number of environmental NGOs have taken substantial measures to control marine litter in China. “However, in comparison to other member states within and outside of the region, Chinese environmental NGO activities have been less recognized by the public, local governments, and regional and international organizations,” the report stated. There are more than 190 environmental organizations relating to ocean protection inside China. Zhang Yu, program officer from Rendu Ocean, one of the main NGOs covering the issue, said that so far the organization has gained a certain level of recognition from the local government and a limited number of programs are funded by the government. It remains difficult for the organization to maintain its normal operations given insufficient funding.